Some of you out there have asked what "Baby Items" we are still in need of. 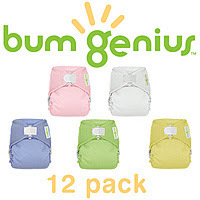 The answer the One-size cloth diapers from Bum Genius. These super cute cloth diapers do not require plastic pants or diaper pins, are easy to use, and best of all easy to clean. The problem is that they require a large initial investment but with the cost of disposables, they will be cheaper in the long run. So if you are looking for the perfect gift for our little Josiah, look no further than cottonbabies.com!